When you answer the phone and a telemarketer on the other end starts obviously and robotically reading from a script, the urge to say 'no thanks' and hang up the phone is almost irresistible. Few things will turn off a prospect faster than hearing a salesperson recite blandly from a phone script. But that doesn't mean that using a script equates to poor cold calling. Here are some tips for calling scripts that can work. Think back to the last really good movie you saw. The actors seemed to speak and react spontaneously. Everything they said and did sprang naturally from what was happening around them. And yet those actors were certainly using a script! The difference is that their scripts were written using language that sounded natural, and the actors were delivering those carefully chosen words while conveying the appropriate emotions. Your own acting skills may not be on a level with Hollywood's best, but you do have one benefit that they don't share. You can write your own scripts using words and phrases that come naturally to you! There's no need to 'act' if you have a well-written phone script because the words on the page are the same words you'd be likely to say spontaneously. But by writing those words down ahead of time, you won't have to worry about losing your train of thought or fumbling your pitch. Those smooth, polished, convincing phrases work in a brochure or even an email, but spoken out loud they will stilted and artificial – or worse, slick and 'sales-y.' Phone scripts should sound just like you do when you talk casually. As you write the script, stick to words you use every day in normal conversation, including pauses, sentence fragments and even the occasional 'uh.' If you have trouble writing a script in this style, tape yourself while you ad-lib a cold call, and then play back the tape and write down what you said exactly as you said it. Then use this core content as the basis for a script that will sound like you do on your very best cold calls. 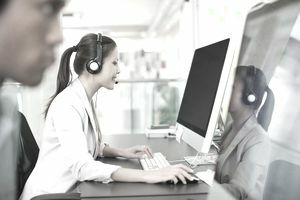 If you're new to sales and an experienced colleague is kind enough to share her phone script with you, be wary of making substantial changes. A script that's highly successful for your fellow salesperson is packed with useful sales techniques and persuasive language. You're better off practicing with that script until it sounds natural instead of adopting your own wording. Once you've had some experience with cold calling and know what works, you can give yourself a little more leeway to change existing scripts. A good phone script should include every part of the call, from 'Hello' to 'Goodbye.' As you encounter common cold call objections, you can draft your favorite responses and include them at the bottom of the script. Always keep a pen handy when you call so that you can jot down any new objections you encounter along with your response. Even the best phone script will get stale eventually. You'll come up with new and more effective ways to grab the prospect's interest and get that appointment. Or a colleague might lend you her cold calling script, with some powerful language that you want to use yourself. And as your company launches new products and changes existing ones, you'll need to modify your benefits phrases to match the new product details. The best way to decide which changes to keep and which to discard is to try them out. When you have a significant change you're considering for your script, use the new wording on 25 cold calls... then switch to the old script and make 25 more calls. If the new version gets you more appointments than the old version during this test, you should keep the change.